Although there’s been a lot of talk about whether the movies in the DC Extended Universe will be overly dark, Warner Bros has been trying to ease concern about this for a while now. It’s previously been said that fans can expect The Flash and Shazam to be more light-hearted stories (like their comic book counterparts), and now there may be a third film with a similar tone on the way. 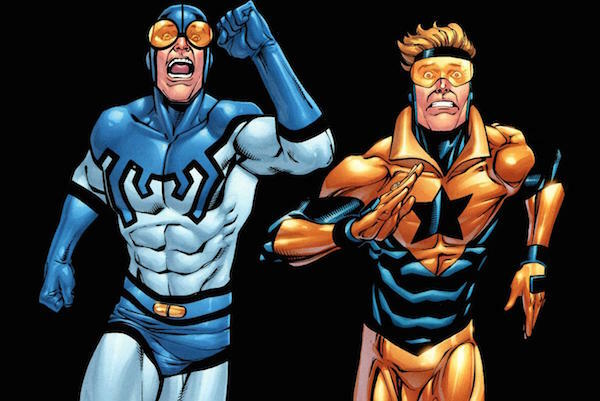 There’s word now that wacky superhero duo Blue Beetle and Booster Gold could lead their own cinematic adventure. The Tracking Board is reporting that Greg Berlanti, executive producer of DC shows Arrow, and Flash and the upcoming Legends of Tomorrow and Supergirl, will direct and executive produce a Booster Gold/Blue Beetle movie. The project is being pitched as a "superhero buddy cop movie," and the website specifically noted how starkly it will contrast next year’s Batman v Superman: Dawn of Justice. Heroic Hollywood is also saying that The Incredible Hulk writer Zak Penn is being looked to pen the script, although they noted this should be treated as a rumor. In addition to the previously mentioned DC CW shows, Berlanti was one of the writers of 2011’s Green Lantern. Booster Gold and Blue Beetle are two of the more comical crimefighters the DC universe has to offer. Booster Gold, a.k.a. Michael Jon Carter, was a washed-up football star from the 25th century who stole some technology from a museum and traveled back to the present day to seek fame and glory as a superhero. Ted Kord is the second Blue Beetle in the comics, but unlike his predecessor and successor, who were able to channel the abilities gifted by the mystical scarab, Ted fights crime using his martial arts skills and the specialized equipment he created himself. The longtime friends were members of the Justice League International, where they would get into humorous antics, much to the chagrin of their teammates. What do you think? Does a Booster Gold/Blue Beetle team-up feature sound exciting to you? Let us know in the comments below, and in the meantime, we’ll keep you updated on any developments regarding this DC project.